Over the past few months Archie (and I) have been enjoying the food pouches from My Little Piccolo. They are organic, full of goodness and super tasty too. I often have a cheeky raspberry and apple pouch as a snack between breakfast and lunch. Archie loves them squeezed into a bowl or he eats it straight from the pouch himself. Recently My Little Piccolo launched their Mediterranean goodness range which Oscar and Archie have both enjoyed. The pouches are great for putting in your bag and when either of the boys want a quick healthy snack they have a pouch each. They love the fruit ones when we are out and about. To celebrate the launch of the new Mediterranean goodness range being stocked in Asda stores, Asda and My Little Piccolo sent us a range of their delicious pouches and ingredients to make a family Mediterranean meal that Oscar could help me cook. We were also sent a fun suitcase full of goodies and Oscar’s very own chef’s hat. We were given the Sweet Tomato Ricotta Spaghetti to make which Oscar enjoyed cooking so much and it tasted absolutely amazing! Take a look at the video below to see how we got on….. Here is the recipe and I would love you to show me any photos or videos of your little ones cooking up a treat! Don’t forget to tag me in it. In a saucepan heat the olive oil and add the onion and garlic and saute these until they are transparent (around 8 minutes). Add the chopped red pepper and carrot and cook for a further few minutes. Add the tin of tomatoes, tomato paste and a few twists of pepper and stir. Increase the heat slightly and let it bubble away for a few minutes, then reduce the heat. Put on a large pan of water and bring it to the boil, add the spaghetti and cook until ‘al-dente’ which is around 8-10 minutes. Add the ricotta and basil to the sauce and stir through. We served it with a nice fresh salad and some garlic bread. Disclaimer: We were provided with the ingredients for the purpose of this post. My views and opinions of the pouches are honest and my own. When we have friends over for dinner I often make a Banoffee pie and it always goes down a treat. Today we have had a lazy day at home so Oscar and I decided to make one for Daddy, plus I was craving the amazing salted caramel sauce from Marks and Spencer. 1. Firstly break up about half a packet of digestive biscuits and put them in a food processor. I have a really great Breville hand blender from Amazon and it was only about £30. It is really good and comes with an electric whisk, food processor, measuring jug and chopper which can be used at two different speeds. 2. Put the butter in a saucepan over heat and let it melt then add to the processor and mix with the biscuit. 3. Put the mixture into a flan dish and leave to set in the fridge for a couple of hours. I line the dish with foil to make it easier to get out when it is set without cracking the biscuit base. 4. Once set take out of the dish and then layer the salted caramel over the biscuit base, I normally use about one and a half jars. 5. Slice the bananas and layer them on to the salted caramel sauce. 6. Whisk your double cream up, make sure it doesn’t go to thick and clotted. 7. Cover the bananas with the cream and then grate chocolate over the top for decoration. 8. Place back in the fridge for about 15 minutes then it is ready to eat! Last week we received a box of goodies from FAGE UK to help us become #YogArtists and create amazing yoghurty creations! 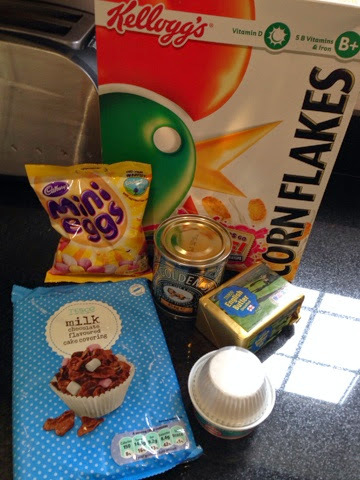 Our box contained a range of yummy ingredients to add to our creations, spoon, lunch box, apron, jars to fill up with yummy yoghurt, stickers, stencils and vouchers to go and get all the yoghurt we needed. Oscar was very excited as he loves cooking and being in the kitchen and even before we had brought our yoghurt’s he was walking around the house in his apron telling Greg and I that he is a chef. We headed to the supermarket and got two massive TOTAL Greek yoghurt pots and four different flavoured Fruyo yoghurt’s. When we got home I asked Oscar what he wanted to make and he decided he wanted to make a yoghurt self portrait. We had lot’s of fun adding almonds and raisins for his eyes, peach slices for his hair, dried apricots for his ears and nose and blueberries for his mouth. He was very proud of his creation. We then used a stencil and sprinkled cinnamon to read #YogArtist and decorated around the edges with cherries, blueberries and raisins. He found this one very tasty mixing the cinnamon with the greek yoghurt. We then made yoghurt’s for his Nannies layering the Greek yoghurt with nut clusters and blueberries. They looked really good in the jars with the twine and lid covers. As for the Fruyo yoghurt’s we have been eating these after dinner and mixing chocolate sprinkles into them. My favourite is the Peach flavour it is so thick and creamy and tastes amazing. The best bit is the yoghurt’s are all natural with no added preservatives or colouring. We have really enjoyed being #YogArtists and have had lots of fun making our yoghurt creations! We will continue to use the FAGE UK products to make yummy things like smoothies, dips, baked potato toppings, ice cream and pasta dishes. You can really use the yoghurt’s for so many different things. Here is a tasty treat to make with your little ones and for more great ideas check out the hashtag #YogArtist on Twitter @TotalGreek, head to Facebook or take a look on the instagram page @FAGE_UK. 1. In a bowl whisk together the Greek yoghurt and cream until thick and creamy. 2. Fold in the Pistachio nuts and apricot jam and fill your lolly moulds. 3. Place in the freezer for a minimum of 2 hours. We had great fun yesterday making chocolate Easter nest cakes and they tasted delicious. We presented them beautifully on our Poundland cupcake holder. Here’s the recipe to make some yummy treats for yourself! 5. Spoon in to 12 bun cases and decorate with a mini egg. With only two days until Mother’s Day why not cook up a treat for your Mum this Sunday. Here are three great recipe ideas to certainly put a smile on your Mum’s face! Whether you’re five or fifty and are a dab hand, or not, with a piping bag, this is such a lovely, personalised gift for your mother. The recipe makes more biscuits than you need but since they freeze so well you can either stamp them out and cook them straight from the freezer, or have them cooked and ready to warm through in the oven for another occasion. And there’s enough icing to decorate about 20 biscuits. Cream the butter and Tate & Lyle Golden Caster Sugar together until light and fluffy, then beat in the egg yolk. To make the icing, put the water in a bowl, sift over the Tate & Lyle Royal Icing Sugar and mix with a wooden spoon until thick, smooth and the consistency of toothpaste. This balsamic and sugar glaze keeps well in the fridge and is a useful addition to have to drizzle over roasted vegetables – be they English roots or a Mediterranean medley of peppers, courgettes and onions. You will also need a piping bag with a 4cm (½”) plain wide nozzle and some kitchen string for trussing the chicken. Impressive and easy to make, this tray-baked meringue can be cooked a day ahead, ready to assemble on the day. Change the fruits according to the season – summer berries or autumnal poached fruits all look, and taste, equally wonderful. You will also need a baking tray lined with parchment paper or silicone. Whisk the egg whites in an electric mixer until light and fluffy, for about 1 minute. Slowly add the Tate & Lyle Light Soft Brown Sugar a dessertspoonful at a time, which will take about 10 minutes, by which time the egg whites will be very thick, glossy and stand up in peaks. Scrape down the sides of the bowl halfway through. Whisk in the cornflour and then the vinegar. Spoon the meringue mixture onto the baking tray, using a palette knife to shape it into an 25.5x20cm (10”x8”) oval. Place on the middle shelf of the oven and immediately turn the heat down to 120°C/Fan100°C, 350°F, Gas ½. Bake for 1 hour until the outside is crisp but the insides are soft and marshmallowy. Leave in the oven until completely cold. This can be done overnight. For the red wine apples combine the red wine, orange juice and peel, the Tate & Lyle Light Soft Brown Sugar and the cinnamon stick in a pan. 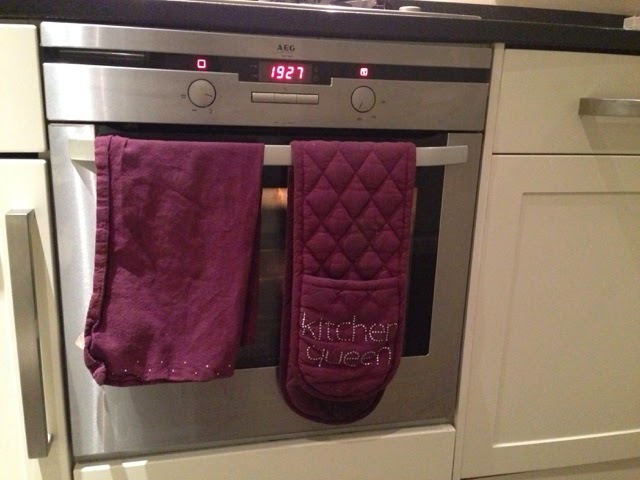 Stir over a low heat to dissolve the sugar, then add the apple quarters and simmer for 25-30 minutes or until tender but they still hold their shape and have taken on the deep red colour of the wine. Remove the apples with a slotted spoon to a shallow bowl, and boil the red wine mixture down to reduce it to about half its original quantity until syrupy. Pour over the apples and leave to cool. Discard the cinnamon stick and orange peel. Carefully transfer the meringue to a serving dish. Add the vanilla seeds to the whipped cream and spoon onto the meringue. Lift the apples out of their syrup, arrange on top of the cream, scatter with the blackberries and almonds, and drizzle with a little of the red wine syrup. Serve the rest in a small jug. Lightly dust with Tate & Lyle Icing Sugar and serve. Cook the apples up to 5 days ahead and store in their syrup in the fridge. Make the meringue up to 1 day before and store in an airtight container. I love food and love cooking new dishes and trying out new things. A couple of months ago I got a Duck recipe of the Internet and thought I would share it with you as it’s such a yummy meal and literally only takes 30 minutes to make! 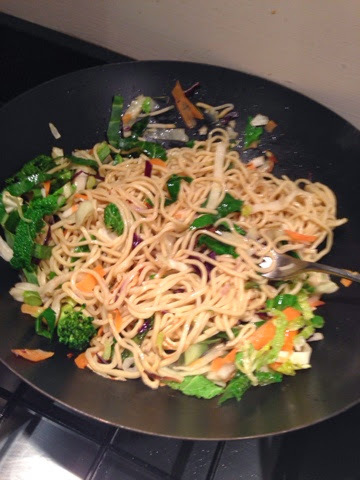 Ingredients: 2 Duck Breasts, egg fried noodles, Chinese five spice, olive oil, stir fry vegetables, cucumber and spring onions. 1. 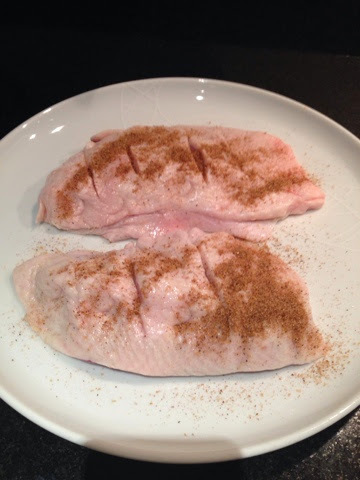 Start by scoring the skin of the duck breasts, sprinkle the Chinese five spice over the top and rub in to the skin. 2. 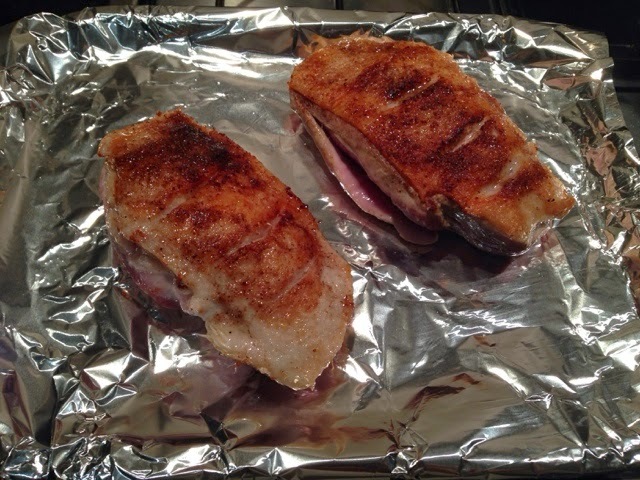 Fry the duck breasts skin side down for 8 minutes then turn over for 25 seconds. 3. 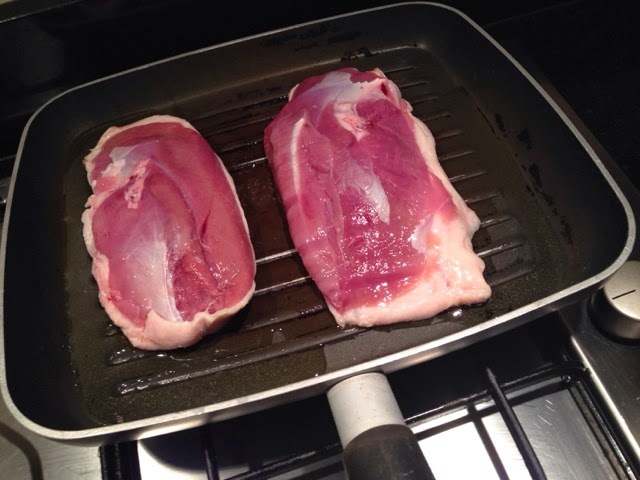 Put into a preheated oven at 200 degrees and cook for between 15 and 20 minutes depending on how well done you like your duck meat cooked. 4. Whilst the duck is cooking cut up your cucumber and spring onions and place on to the plate. 5. 5 minutes before your duck needs to come out put your stir fry vegetables and noodles in a wok or large frying pan and cook for 4-5 minutes until they are warmed through. 6. Place the noodles and stir fry in the middle of the plate and get the duck out of the oven. 7. 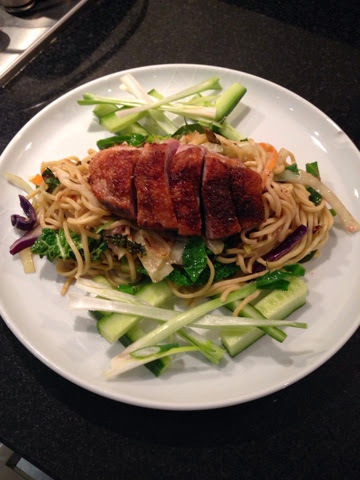 Slice your duck and place on top of the noodles to serve. So it’s Valentine’s Day Tomorrow and they say the way to a man’s heart is through his stomach so why not bake up some of these tasty treats from Tate and Lyle. You will also need 2 baking trays lined with parchment paper,a 8cm (3¼”) heart-shaped cutter and a piping bag fitted with a star nozzle. To assemble, lightly whisk the cream, divide between half of the meringue hearts, spoon on the cherry compôte, then top with the remaining hearts. Arrange on plates, lightly dustwith Tate & Lyle Fairtrade Icing Sugar, decorate with thecrystallised roses and serve. Sift the Tate & Lyle Fondant Icing Sugar into a large bowl and make a well in the centre. Add the water, a teaspoonful at a time, and stir with a wooden spoon until it is too stiff to stir any more. Roll the icing into a ball and turn out onto a surface lightly dusted with Tate & Lyle Fondant Icing Sugar andknead for a few minutes until it becomes completely smooth, soft and pliable. If it feels too dry splash with a very little cold water and carry on kneading until the water is absorbed. If it’s too wet, dust the surface with extra Tate & Lyle Fondant Icing Sugar. On New Year’s eve we went to our friends Leo and Bianca’s. We always spend New Year’s eve with them and their families. They always have the most amazing home cooked food and Greg and Oscar loved their Pasta Alforno. I asked Mariangela (Leo’s Mum) for her recipe and tried it for myself. It’s a relatively easy dish to cook and I make enough so there is some left over for Oscar’s dinner the next day. 1. Cook the mince and your bolognese sauce (Lot’s of it). 3. Partially cook penne pasta shells. 4. When the sauce and mince is cooked mix together the with penne pasta shells and peas in a large oven dish. 5. Slice the boiled eggs and mozarella balls (I use three) and layer over the top. 6. Smoother more sauce over the top then add Parmesan cheese over the top of the sauce. 7. Bake with foil on and cook until heated through, take off the foil more the last ten minutes to brown. On Thursday we put together with icing our gingerbread house that I had got for a real bargain from Morrisons for only £4.99! We let it set and then covered it in icing and sweets! Oscar loved covering it in sweets, eating quite a few as he went. We then decided to cover the plate it was on like a garden of sweets. We had great fun for atleast two hours decorating the gingerbread house. It’s such a cheap and fun Christmassy thing to do. With the kit from morrisons plus extra sweets and icing pens it only cost about £10. The kit itself had the gingerbread house, white icing and three different types of sweets in it. After we finished it Oscar had a bite of the roof and it tasted as good as it looked!